Jim Crowley originally seemed content to take a lead off the veteran Take Cover, but after barely a furlong he had switched back inside and was soon towards the head of affairs. Kachy attempted to match strides, but by halfway it was obvious nothing was going to be quick enough to stay with the 8-11 favourite. Inside the final two furlongs Charlie Hills’ Battaash just pulled further clear and crossed the line four lengths ahead of some of the fastest horses in training. What made the performance all the more remarkable was Battaash was conceding 3lb and more to his rivals, and his defeat at Royal Ascot can now be forgotten. The veteran Take Cover, now 11 and a dual winner of the race, finished second with Muthmir, in the same ownership as the winner, just holding off Mr Lupton for third. Battaash is now around the even-money mark for the Nunthorpe at York later this month, where it did not go to plan 12 months ago as he got very worked up beforehand. Hills said: “It was pretty special, he’s some horse. Jim always looked in control. “It was fantastic, apart from the fact that they split a bit at the start and he had no company it all went to plan. Jim had no option but to let him go forward. 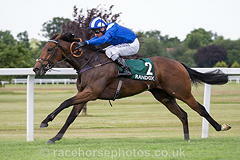 “He’s been training a lot better at home since Ascot and Gary Witheford has done a great job with him at the stalls. He’s growing up and I think that’s the best he’s behaved in the whole of his career. “Today he came right back to his best and there is a great programme ahead with three weeks between each of three races, starting with the Nunthorpe. Crowley said: “He’s the Batmobile. He dragged me to the front, there isn’t a horse in Europe fast enough to lead him. “This year I’ve noticed he’s a bigger, stronger horse. I don’t think he was in the same form at Ascot as today. “Last year I got to the start early at York and it blew his brains. I can’t wait (to go back). A showcase for raw speed, this prestigious sprint was introduced in 1911 to mark the previous year’s succession of King George V to the British throne. The Qatar King George Stakes is Goodwood’s top sprint and in 2002 was named the King George 200th Anniversary Stakes to celebrate 200 years of racing at Goodwood. Fillies and mares are etched in the folklore of the King George Stakes, with Land Of Dreams (1998), Cassandra Go (2000), Agnetha (2002) and La Cucaracha (2006) also beating the boys in recent years.